Or settled, O our John? John, who lived in the city of Lykos (of the Thebaid), and who had learned in his youth the craft of the carpenter, and whose brother was a dyer, afterwards, when he was about five and twenty years old, took upon himself the garb of monkhood; and having lived in diverse monasteries for five years, he finally departed by himself to the mountain which is in Lykos, to the lofty eminence which is on the top of the mountain, and made three cells for himself there. Now he built and prepared these for himself in the first year after he went to the mountain and went up into it. The first cell was for the needs of the body, in the second he labored at the work of his hands and took his food, and in the third he said his prayers, and during the three (or thirty) years in which he was in seclusion there he was wont to receive whatsoever was necessary for him through the window from him that ministered unto him. Now this blessed man was worthy to receive from God the gift of being able to declare things before they came to pass, and on several occasions he made known things before they happened unto the blessed Emperor Theodosius. I mean he foretold that he would conquer Maximus the rebel and would return from Gallia, and he also announced to him beforehand concerning the defeat of Eugenius the rebel, and thus the fame of this holy man went forth greatly, and he was held to be a man of spiritual excellence. Now therefore when we were in the desert of Nitria, I and the members of the following of the blessed Origen wished to gain exact information concerning the state of spiritual excellence to which the man had attained. Thereupon the blessed Evagrius said, “I am very desirous of learning from someone who is skilled in the investigation of the mind and understanding what manner of man [John of Lykos] is; for although I myself am unable to see him, still I can learn from another man concerning his qualities of excellence if he be able to narrate them, but I cannot go so far as his mountain.” Now when I had heard these things I said nothing whatsoever to any man, and I held my peace for a day, but on the morrow I shut up my cell, and having confided myself to the hands of God I set out on my journey to go to the Thebaid, where I arrived after eighteen days, on some of which I walked on my feet, and on others I sailed on the river. For it was the period of the year when the river rises, and when many folk fall sick, the which also happened unto me. And when I had gone [to John of Lykos] I found that he had shut himself up in the place wherein he lived in seclusion, and I took up my abode with the brethren in a great house which contained about one hundred men, and which the brethren had built a long time; for though they shut in John during the other days of the week on Saturday and Sunday they used to open his window. When therefore I had learned the rule concerning his seclusion, I waited until Saturday, and at the second hour I drew nigh and found him sitting in the opening in the wall (or window), wherein he waited to administer comfort and consolation unto those who thronged unto him. And having saluted me he said unto me through an interpreter, “Where are you from, my son? And why have you come? 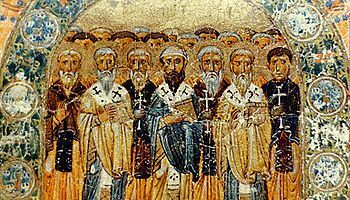 You appear to me to belong unto the congregation of Evagrius.” And I said unto him, “I am a stranger from the country of the Galatians,” and I confessed that I also belonged unto those who were the followers of Evagrius. Now while we were conversing together behold, Alipius, the governor of the country, came unto him, and as the governor turned to him John ceased to talk to me and I left them for a little space and gave them opportunity to talk, and I rose up and departed from the mountain. And when they had passed much time in their converse I became impatient and angry, and I murmured against that excellent old man because it seemed as if he had treated me lightly and had paid honor to the governor; and being offended in my mind at this treatment I made up my mind to go away because of his disregard of me. Then John called unto his interpreter, whose name was Theodore, and said unto him, “Go and say unto that brother, ‘Be not angry and impatient, for I will dismiss the governor immediately, and then I will speak with you.’” Thus it appeared to me that, like a spiritual being, he had knowledge of secret things, and I made up my mind to remain. And having said these things I entreated him to forgive me, and I became certain in my mind that he was a spiritual man. Then with a smile he patted my left cheek with his right hand, and said unto me, “Many temptations will rise up for you to endure, and moreover, for many years past you have struggled to go forth from the desert, and you struggle even to this day, but you have been afraid; and the causes thereof, which were thought by you to arise from the fear of God, the Evil One himself sowed in your mind; and although you did drive away your thought from yourself you have kept him with you. For he sowed in you the thought of desire, which was also pleasant unto you, that is to say, you did care greatly to bring out of the world your father and also your sister that they might take upon themselves the garb of the monastic life. Now there still remain to your father seven other years of life, therefore continue to abide in the desert, and do not on account of these thoughts desire to go to your kinsfolk, for it is written, ‘No man who has put his hand on the ploughshare and looks back is useful to the kingdom of heaven’” (Luke 9:62). Now, therefore, being helped by these words whereby I triumphed I gave thanks and praise unto God Who had quieted and laid to rest in me the cause which was urging me to go forth from the desert. Now the handmaiden of Christ Poemenia came unto the blessed man and begged that she might see him, but the blessed man would not allow her to do so; and he sent unto her other spiritual words to give her consolation, and he commanded her that when she was going down from the Thebaid she should not turn aside to Alexandria, saying, that if she did so, she would certainly fall into temptations. But Poemenia, forgetting this advice and never letting it enter her mind again, turned aside to Alexandria that she might see the city, and on the way, by the side of the city Nicius, she stopped her ship that she might rest herself. And when her servants had disembarked, through some unknown circumstance strife broke out between them and the people of the country, who were truculent men, and they cut off a finger of one believing man, and another they killed, and without knowing it they drowned the holy Bishop Dionysios in the river. And they made the venerable woman to endure many revilings and threatened to do much violence unto her; and they beat all her servants with many severe stripes, and they would hardly allow them to proceed on their way.